A tough little tree grows along the Red Sea and arid regions of Northeast Africa, Libya and Iran. Surviving against the odds, the little tree weeps a bitter red-brown resin with remarkable healing properties. Its name is myrrh. Like her namesake, Queen Myrrh emerged from her cell into adversity. She arrived as the rains came to the desert bringing plants, trees and flowers back to life, while she waited inside the hive. Myrrh, who inherited a dying colony from her drone-laying mother, Rosemary, was desperate to go out on her mating flight, but every beat of her wings would have been a race against the wind and rain. A mild spring of sunshine and showers is vital for bees to forage and build-up their stores after winter, and fine days are needed for the mating flights of virgin queens. However, the torrential rain over the past six weeks has trapped bees inside hives and left hungry mouths to feed. 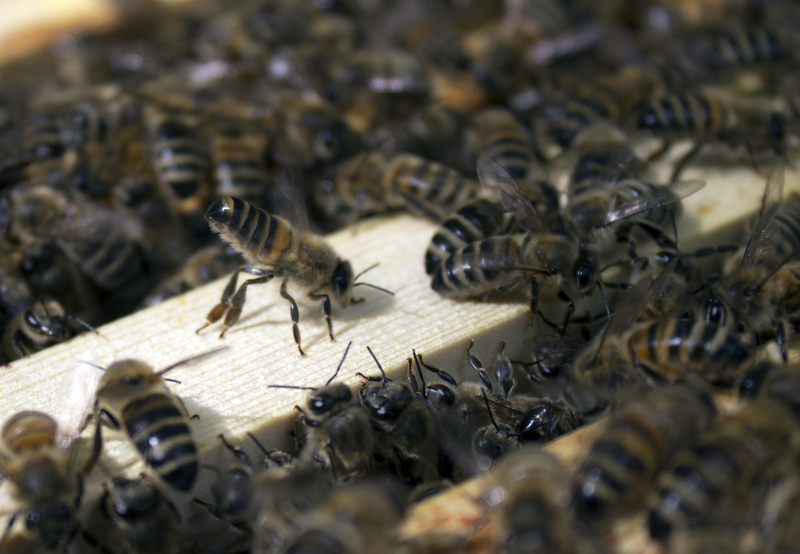 Warm, sunny days are needed for drones to fly out to congregation areas where they swarm about thirty to ninety feet above the ground and wait for virgin queens to fly past. No one knows for certain how drone congregation areas are found by drones and queens, but each spring they make amazing spectacles of life and death. However, the weather was not kind and Myrrh never left the hive. Unable to mate with drones from her own colony because of the risks of inbreeding, she could not lay eggs to replace the workers reaching the end of their life cycle and the drone her mother had laid. The colony had become quite small by the time Emily and me were able to open the hive for an inspection. We were sad to see Myrrh walking across the frame without her retinue of workers and her small abdomen indicating that she had not mated. 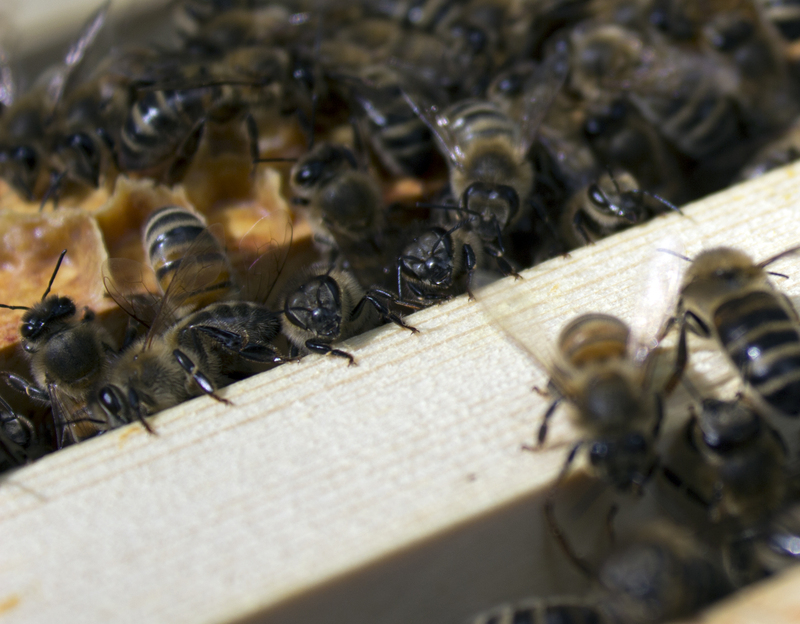 We continued to check through the hive to make sure that there were no eggs or larvae – the queen can also look small and slim before swarming when she is starved by the workers to make her fly, but this was unlikely to be the case with Myrrh. A few weeks ago we had put in a frame of larvae from Lavender’s hive, but this was uncapped probably because there are not enough workers to raise brood. We didn’t find new brood. Worker bees having a chat. Chilly temperatures this spring meant that opening the hives would do more harm than good, leaving nature to decide the fate of Myrrh. We could not introduce a newly mated queen while Myrrh was inside the hive, because the workers would see her as an intruder and kill her. Emily and me talked over the options because, while there was nothing we could do for Myrrh, there were the surviving bees to consider. It was too late to give the colony another frame of larvae from Lavender’s hive, because there were not enough workers to rear a new queen and her bees. For the same reason, it was too late to introduce one of the mated New Zealand queens recently bought for the apiary. The dying colony was mostly drone, but could be saved by combining with Lavender’s hive. It was a big decision to finally collapse this colony, so we decided to close the hive for a few days to consult wiser beekeepers than ourselves. 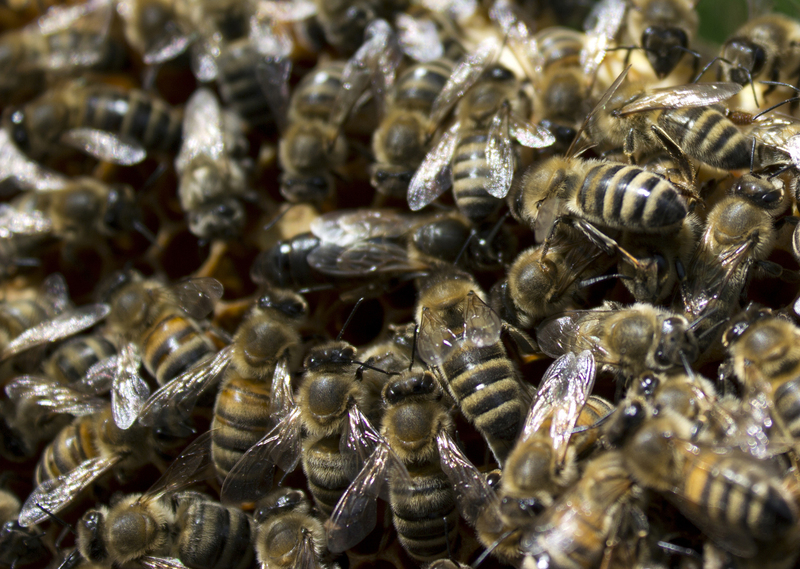 Drones carry the characteristics of their hives to other colonies through mating with the local queens. Emily and me have good-natured, hard-working bees, and we would want our drones to survive and mate with other queens in the area. Queen Lavender’s hive was a happier picture full of bees, brood and stores. 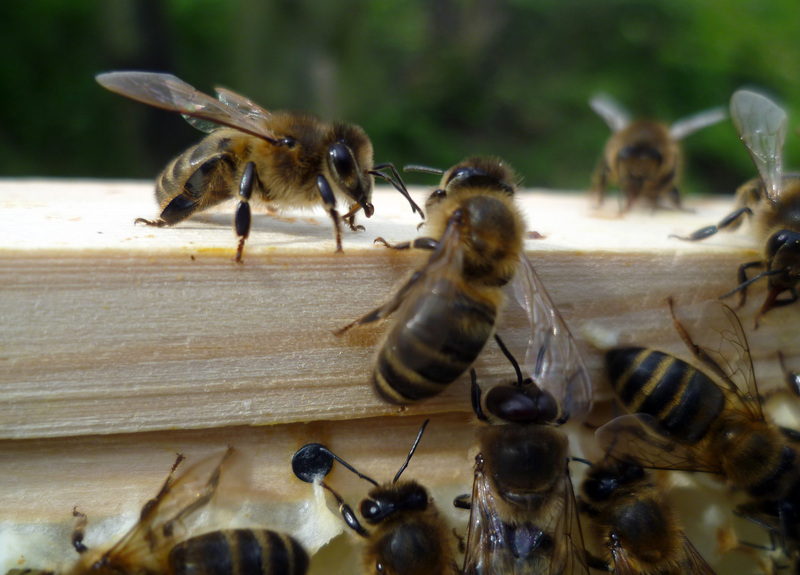 The bees had completed the Bailey comb change by themselves – clever bees! – and the brood in the bottom had hatched and moved up to join the queen. We took away the old brood box and placed the new brood box on the hive floor, removing the dummy board to give them space to expand. The old brood box, with straggler bees shaken out into the queen’s nest, was placed on top with an empty super in-between for the bees to rob the remaining stores. We saw signs that Lavender’s bees are trying to make queen cells – it is the swarming season – but with more space in the brood box this instinct may be delayed. We will have to watch them carefully over the next few weeks. I spied a worker waving her abdomen in the air, exposing her Nasonov gland and fanning her wings to spread the scent to guide foraging bees back to the colony. She may have been doing this because we kept Lavender’s hive open longer than usual to complete the Bailey comb change. Emily and Drew had brought along their friend Owen, who was scouting out the situation about bees for his girlfriend, Fran. So we wandered round the apiary for a while and topped up the sugar syrup in the other hives and nucs. In May we wouldn’t normally feed bees because the supers would be on the hive, which we would like the bees to fill with nectar not sugar. However, the wettest April on record for the past 100 years in the UK has bought famine to many bee colonies and the National Bee Unit has issued a starvation warning to beekeepers to continue feeding their hives. At the height of summer, a forager bee visits around 2,000 flowers a day to collect enough nectar and pollen to feed around 50,000 hungry bees inside the hive, and new bees are hatching all the time. So if bees can’t fly out and stores are low, they need a lot of sugar! Beekeeping done for another Saturday and the sun still shining, Emily, Drew, Owen and me ended the afternoon in the beer garden at The Fox Inn, in Hanwell. The reign of Queen Myrrh has been painfully short and bitter, but she has inspired an aromatherapy blend. Run the bath and then sloosh round the blend to disperse the oil as much as possible (you can use full fat milk or cream or an unscented bath gel as a carrier agent, if preferred). Patch test the blend if you have sensitive skin. Do not use if you are pregnant. This is a dark, smoky and reflective blend. In The Complete Guide to Aromatherapy, Salvatore Battaglia describes myrrh’s effect on the mind as ‘one of inner stillness and peace, of an awareness free from restlessness and the mundane’. Clove and ginger were added for depth and warmth. Emily and me attended the London Beekeepers Association Bee Health Day on Sunday (we were really as busy as bees this weekend!) and listened to very useful talks from our local bee inspectors on how to manage bee diseases and keep happier, healthier bees, which will feature in future posts. This entry was posted in Aromatherapy, Beekeeping, Bees, Nature and tagged Bailey comb change, bees, feeding bees, hives, honeybees, myrrh, queen bee, rain by Emma Maund. Bookmark the permalink. Fascinating read; sad to hear about poor Myrrh of course. the tip about the twig from the feeding store is useful – I have found I needed to drip syrup so they get the hang of it but this must be much better. The bees do get excited about sticky twigs. Poor Myrrh, our bees always make lovely queens but they have been unlucky this year. We might not get any honey as varroa treatments start in August and preparing the hives for over-wintering, but I’ll be happy to have healthy bees going into winter to last for next spring. wow! beekeeping is interesting 🙂 and I LOVE your Myrrh blend!!! I love Myrrh with Rosewood & Frankincense for meditation, healing & a touch of magic! Beautiful pictures and a very sad story…. 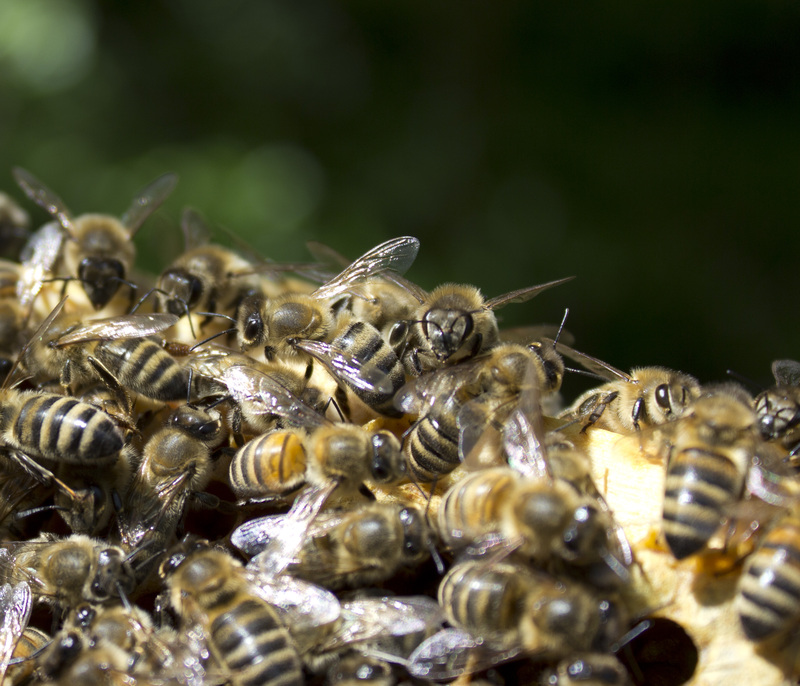 Nature can be uncompromising but this year has been particularly bad for bees. A second colony is always a good idea as the two colonies may also help to support each other throughout the year with frames of larvae or queen cells (providing there is no disease). 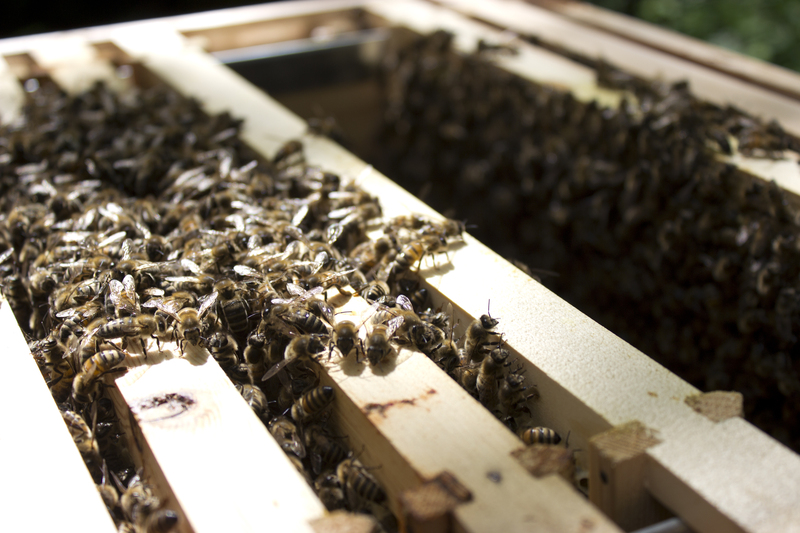 At the LBKA Bee Health Day, the speakers said the honey flow in London can continue through August and into September, but that it was better for the colony to start varroa treatments and allow the hive to build-up its own honey stores for over-wintering from the end of July. After such a wet spring and start to summer, making sure Lavender’s hive is strong and healthy for winter will probably be the priority for the rest of the season. You have described all the events so well! Loved the pic of all their heads peering up from the top of the frames. That would be great if you get a chance to go, no worries if not though. Even if we only get one frame of honey I’d be really happy with that at this point! It is sad, I think she would have made a very good queen like her mother, Rosemary, and grandmother, Rose. Her aunt Lavender is quite feisty though, so we’re hoping she’ll pull her bees through this horrible weather 😦 The name Myrrh seems quite apt considering her fate! I was going to suggest the name Rose for a new queen. I can’t believe it’s STILL so awful over there!! You have such a lovely gift for transporting me out of a terrible work week and back into the magic bee kingdom. Thank you for a beautiful post. I always learn so much reading your blog. 🙂 The way you described the mating of bees–whoa! Poor drones! I had no idea mating could be so violent. I am wondering how you make your hive stands? They look sturdy and simple. I have an ant problem and it seems like I could defend my hives more effectively with hives on stands like yours. Thank you for any direction!! The hive stands were set up at the apiary on steel runners. You can help protect bees from ants by rubbing Vaseline on hive legs or if it becomes a real problem you may need to find the source of the path of the ants to block off or move the hive. I am enjoying your amazing posts of the intricate lives of Bees.. I had no idea the mating slot was so short and when you think about it Bees are up against a lot.. Nature is a fine balance for the honeybee but they are clever and determined creatures, which is why they’ve been around for millions of years I guess! The biggest challenge, I personally think they face along with other pollinators, is habit loss. All those front gardens concreted and parks neatly landscaped are part of our unwillingness to share space with nature.